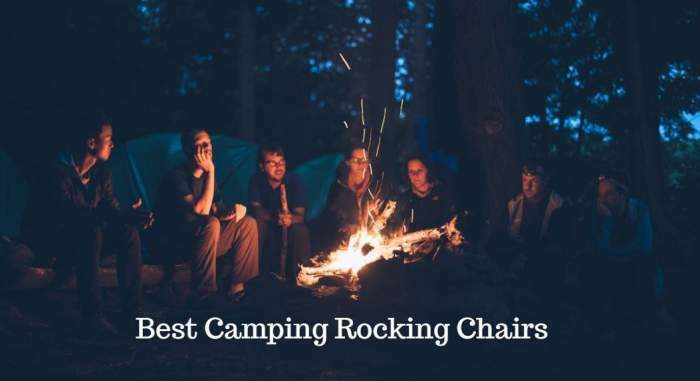 Here you have my list of the best camping rocking chairs currently available on the market, built in very different styles and with different features for a variety of activities. All the models here are handpicked and described in details in my separate reviews, so please follow the links below to read more. 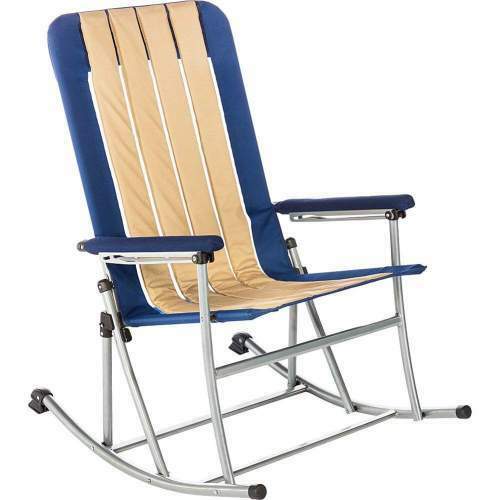 Folding rocking camping chairs. Those are typically the models that need no assembly, you just spread the chair and it is ready in a second. 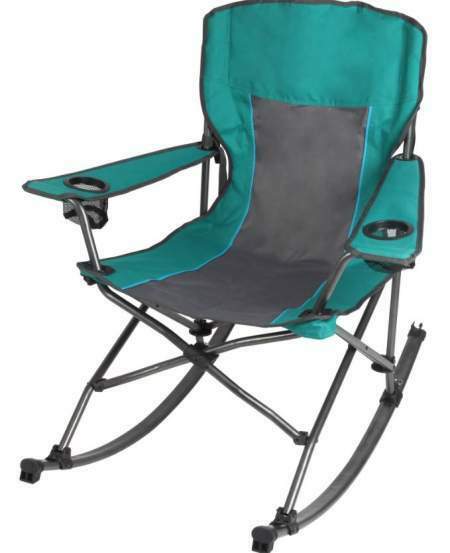 But these chairs remain quite large in two dimensions so bear this in mind when you plan how to organize the space in your car when you prepare for camping. These chairs are relatively heavy and bulky, and they are definitely not backpack-portable. 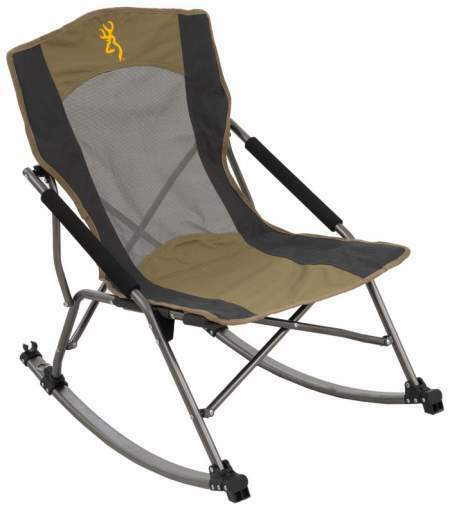 There are also models that are collapsible camping chairs with removable rocking rails. So this type needs a simple assembly and their packed size and weight are such that they are backpack-portable. I have included also a great example of a swing chair. Some of the chairs here are very tall and with a good headrest. These include both types mentioned above. You will see also that most of them are with solid armrests. This is a useful feature to have as it makes it easy to get in and out of the chair, but this also adds to the weight. Regarding the frame, some of them are steel and some are aluminum. This is normally reflected in their weight. So here is my list of chairs ordered by weight with the lightest on the top. 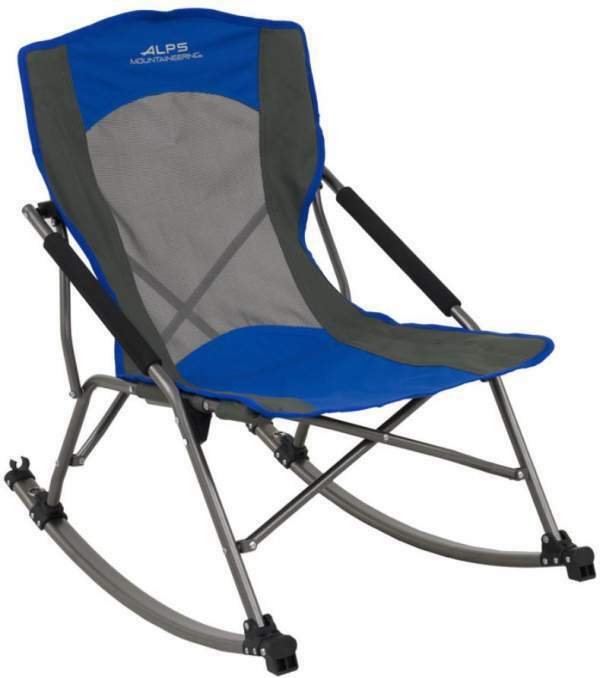 The Helinox Chair Two Rocker is a quite unique design. Obviously, it is here because of its rocking feature; so you have two rails shown in the picture above, which are the reason for having it here in the list. But note that these rails are also removable, and what remains is a very lightweight backpack-portable chair. The total weight is 4.1 lb (1.85 kg), yet the capacity is impressive 320 lb (145 kg). 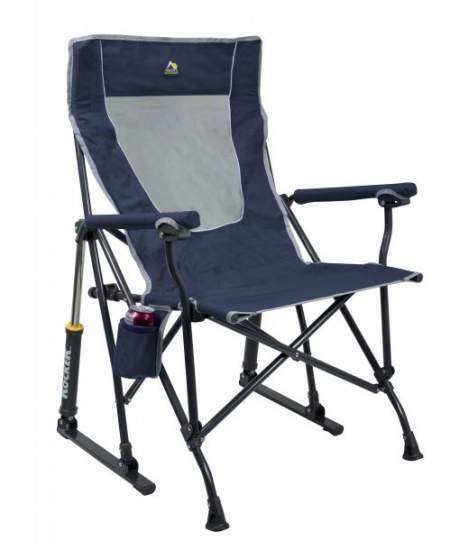 Note also that it is fully collapsible and with a very good packed size as compared with other chairs in the list; it packs to 24.4 x 6.5 x 6.5 inches (62 x 16.5 x 16.5 cm). This is not all; the chair is with a high back, so you have a good headrest and this is why I have included it in my list of chairs with headrest. Please read more in my full review. Strictly speaking, this Stargaze Luxury Chair is not a rocker, this is a swing chair. But it is so totally unique that I could not resist. In a sense the principle here is somewhat similar to what you will see in the GCI chairs below. There is a fixed frame and the seat moves. The seat attaches to the two side poles shown above. It comes with an automatic reclining mechanism so you can enjoy and watch the stars in the camp. You also have a pleasant adjustable headrest which you see in the picture. It is with Velcro tabs so you can move it to fit your body size. The chair has solid armrests, and you get a bottle holder and a storage pouch, and a carry bag included. 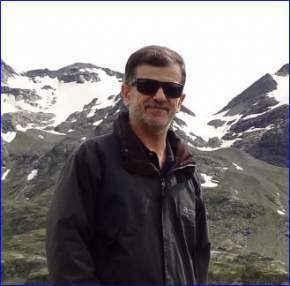 The weight is only 6 lb 5 oz (2.86 kg) and the packed size is 23.5 x 6.5 x 6.5 inches (60 x 17 x 17 cm). 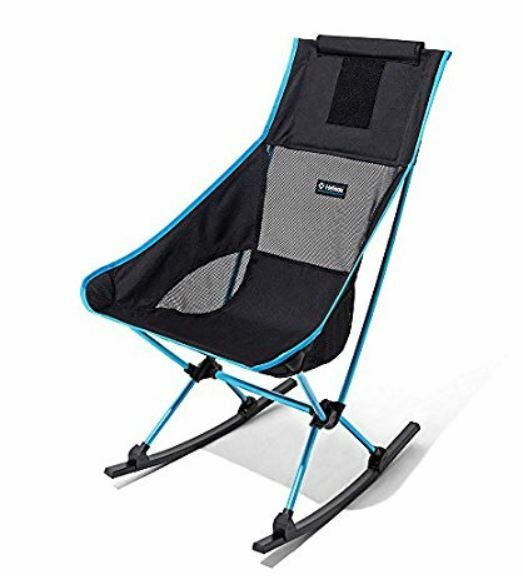 This ALPS Mountaineering Low Rocker Chair is very similar to several other chairs in the list, but as the name suggests, this is a low chair with the seat at 15 inches (38 cm) above the ground. It comes with a nice carry bag with a shoulder strap so you can carry it shorter distances. But note that it weighs 11 lb (5 kg), which is again quite similar to some other chairs. The rails which you see in the picture have a pair of pins which you pull and release the rails, and this is how you collapse the chair and store it in its carry bag. The same system is in the Browning Camping Cabin chair below. The capacity is 300 lb (136 kg). This Cabin Chair is a rocker and this is why it is here in the lits. The design is such that it is partly a folding type and partly a collapsible chair. Namely, all elements remain interconnected all the time, but it folds and closes when you pull two pins that are behind the rear legs. So it needs a very simple assembly. The packed size is much better than in most of other chairs below, and this is due to its particular armrests design. So it remains large only in one dimension, it packs to (L x D) 34 x 10 in (86 x 25 cm). The frame is steel, yet the chair is high in the list here because of its weight which is only 11 lb (5 kg). It is portable, but you need a car for transportation. Timber Ridge Catalpa Relax and Rock Chair. The Catalpa is a folding and rocking chair, one of those that you fold so that it remains relatively large only in one dimension. So the packed size is 32.75 x 9.75 x 6.9 inches (83 x 25 x 18 cm) and transporting it in the car should not be a problem. The weight is quite medium, 11.4 lb (5.17 kg). The chair is padded, and you see from the picture that it has solid armrests with a foam for padding. To fold the chair you release the two pins which are visible on the rocking rails. It comes with a nice carry bag, and you should know that this is a really affordable chair. This is a chair without any assembly, just spread it in a second and it is ready. You have padded armrests here and a very high back section which provides a good headrest. The packed size is not so great, the chair remains large in two dimensions, 37 x 28 x 7 inches (94 x 71 x 18 cm). The frame is aluminum and the weight is moderate for such a type, 12 lb (5.44 kg), but clearly, this is not a lightweight tool. It is built for comfort, so it is heavy and bulky and you need a car for transportation. 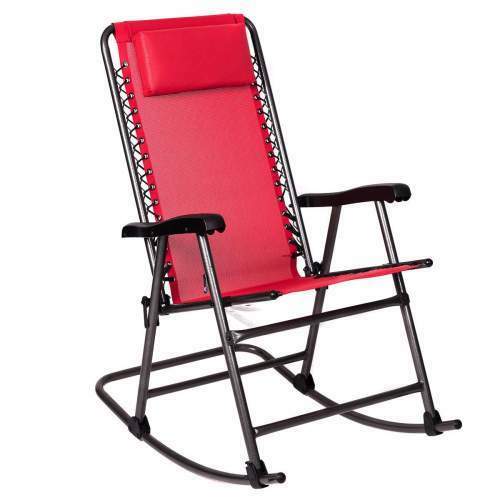 GCI Outdoor FirePit Rocker Chair. This is a rocking chair with the spring action rocking technology; those two pistons which you see on the back contain the rocking system. As you realize, it sits on the two bars so it will keep rocking on any surface. 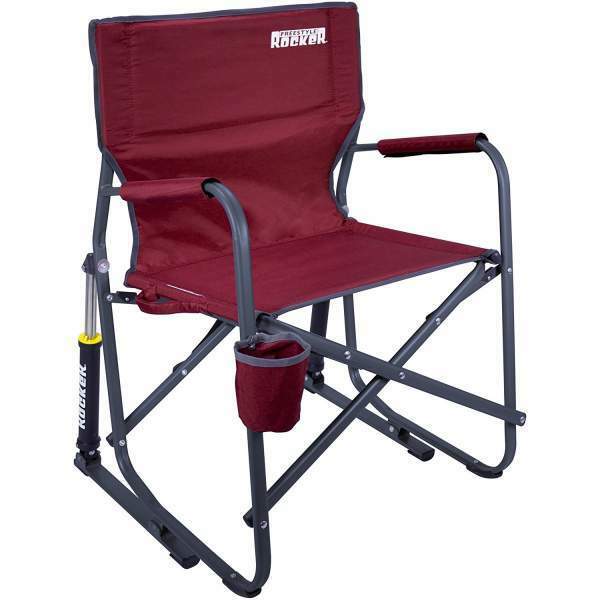 This is a folding chair so you can make it ready in seconds and equally fast you fold it away. But it remains quite large and boxy in two dimensions, this is because of its solid armrests that do not fold. It comes with a cup holder and the armrests are padded. The weight is 11.9 lb (5.4 kg), which is reasonable in view of all the steel that you have there. Note that it is rather low, and this is the main difference between this chair and the other from the same brand below. 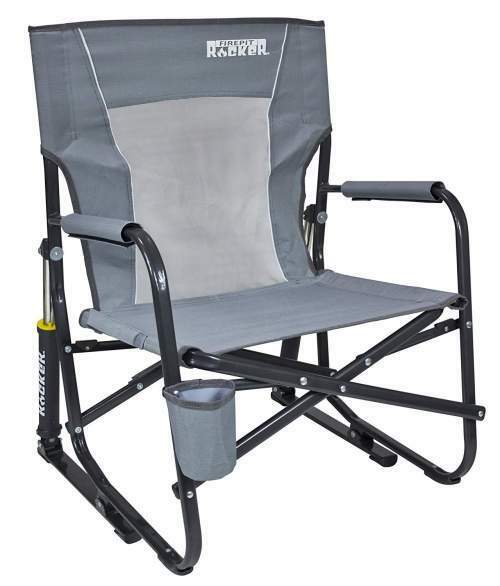 GCI Outdoor Freestyle Rocker Portable Folding Rocking Chair. Here you have something really specific – this is a rocking chair with a unique hydraulic rocking system which includes two pistons on the back. So the bars on the ground do not move at all and this is a floor-friendly design. At the same time, such bars prevent sinking when you use it on a soft ground and sand, so it will preserve its rocking feature on any surface, and this is what makes it completely different from its competitors. The chair is padded, and you have solid armrests. The back section is not high enough for the headrest, just to know. If you need such a design check some other chairs here in the list. The weight is moderate for such a construction, 12.1 lb (5.5 kg), and the packed size is large 34.8 x 25 x 4.9 inches (88 x 64 x 12 cm). Please follow the link for more. 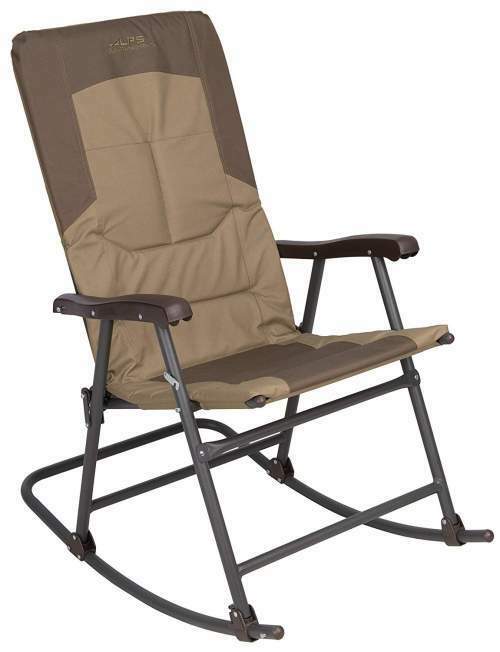 GCI Outdoor RoadTrip Rocker Chair. This RoadTrip chair has the same Spring Action Rocking mechanism as the other chairs of this brand shown above. But it also has some extra features that make it completely unique. First, notice that it collapses so that only one dimension remains a bit large. The packed size is 43.5 x 8.7 x 8.1 inches (110.5 x 22 x 20.5 cm). In addition, it comes with a carry bag so you can carry it attached to your shoulder. The chair has an extra pair of legs which you see in the picture above, so when you lean forward you have 4 points on the ground, please follow the link below to realize how this works. The weight is 13.2 lb (6 kg), and the chair is quite big and the seat is high, at 19.7 inches (50 cm) above the ground. It comes with solid and padded armrests, and you also have a headrest because the chair is 39.8 inches (101 cm) high. So I have included it in my list of chairs with headrest. This Ozark Trail chair is quite unique here with its soft armrests. As you have noticed the other chairs here in the list are typically with solid armrests. Yet another remarkable feature is that these armrests are with two cup holders. 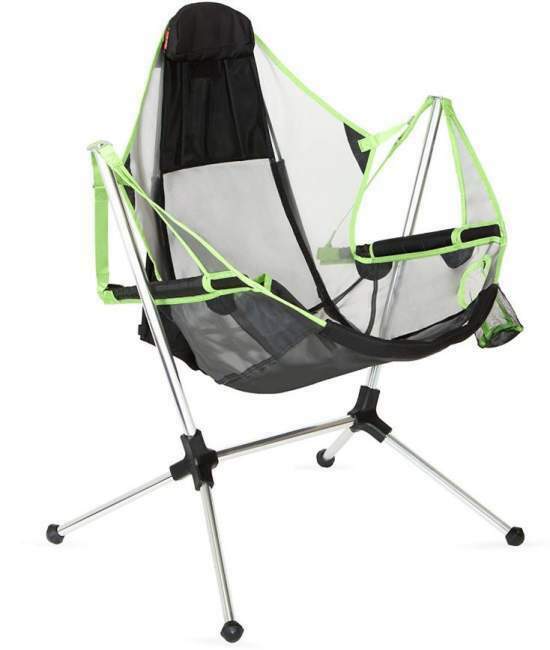 The chair comes with a carry bag so you can carry it short distances attached to the shoulder. But it is a bit heavy and this is why it is in such a position in the list. It weighs 16.23 lb (7.4 kg). But the dimensions are great, it measures (W x D x H) 32.8 x 38.2 x 38.2 inches (83 x 97 x 97 cm). 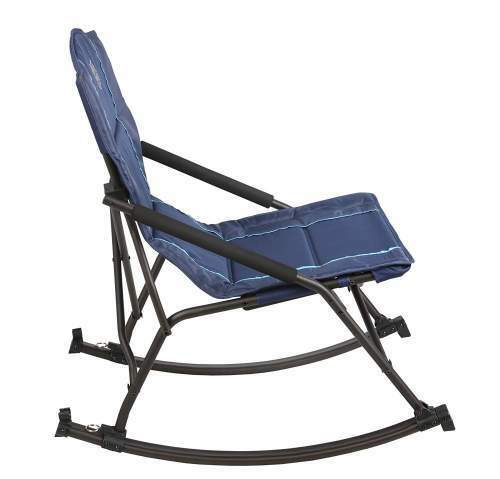 So this is a very comfortable rocker and the price is also hard to match. Please follow the link for more. 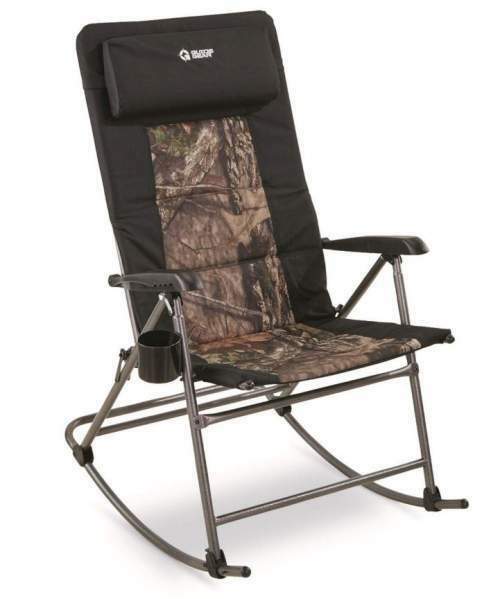 What you see in the picture is one of the two versions of this folding camping rocking chair. In both versions, you have a very high back section and a good headrest. This is why I have included it in my list of chairs with high back and headrest. Obviously, this is a rocking type, but you also have good and ergonomic armrests. The frame is steel and this is why it is so heavy, no less than 16.53 lb (7.5 kg). It is also bulky when packed, bear this in mind when you choose your camp spot, I would not carry it long distances. Please read more in my full review. This is one of those chairs that remain large in two dimensions when packed, similar to the Timber Ridge chair above, so the packed size is not so great 47 x 26 x 6 inches (119 x 66 x 15 cm). The chair is also very heavy, you have 17.5 lb (7.9 kg). But this is a very sturdy, stable, and comfortable chair, built to last. There is padding throughout the chair and the back section is very high, one of the highest on the market with 104 cm from the ground. So you have a great head support. There are also very strong armrests here built from a hard plastic. More in my full review. This Guide Gear Chair is in the list because of its rocking design, but it is also an exceptionally strong chair that can support up to 500 lb (227 kg) capacity. I have added it to my list of chairs for heavy people. This is not all, the back section is very tall, no less than 114 cm from the ground, so you have a great headrest and I have included it also in my list of chairs with headrest. It comes with solid armrests as well and a bonus cup holder. Note that it is quite heavy with its 17.5 lb (7.9 kg). This is a folding design so it remains quite large in two dimensions when you fold it for storage. 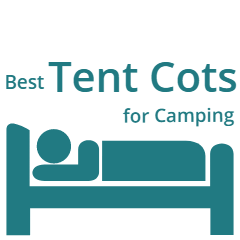 So this was my list of the best camping rocking chairs currently on the market. It will be updated regularly as I spot new quality items, so bookmark this page and come back from time to time to check for updates. Thank you for reading. Do you have any experience with such chairs? If so, please share it here, there is a comment box below. I wish you a nice day.